Doesn't that title just sound so sweet and nice? I thought so. Such tenderness. One of my brothers-in-law announced his engagement over the Thanksgiving holiday. Since we were in town, they asked if I would do engagements for them. Most of you reading this are probably aware that engagements, weddings, family pics, etc. are not my usual thing; however, there are occasions such as this one that I am happy to do it. 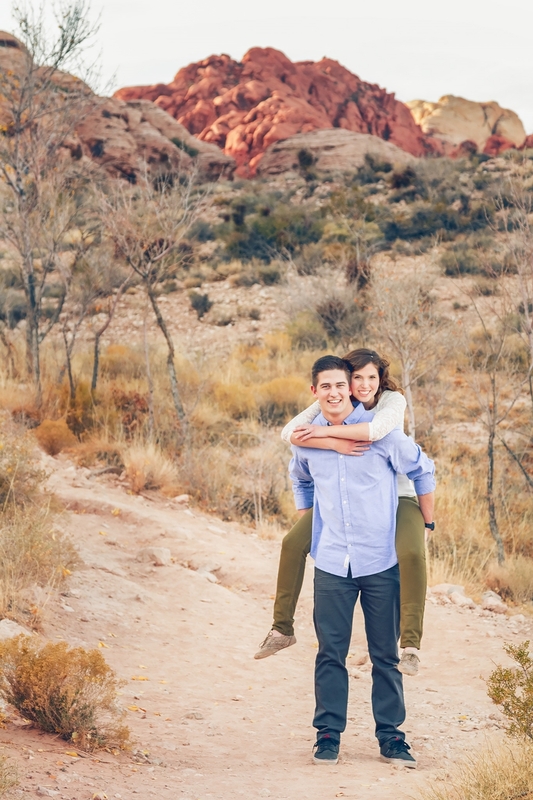 A few days previous, we had gone as an entire family group to an area called Calico Basin to do family pictures. It is a beautiful little area, surrounded by delightful red rocks. The usual desert lanscape of sand and sagebrush is interjected with lots of red stone and trees with vibrant yellow leaves of the late Fall. A gorgeous location for the type of photos that were being done, and an obviously popular spot for such photos as probably 85% of the other people/groups that were there were doing the same thing! Unsurprisingly, we decided to return to that spot for the engagements. One of the things that I really wanted to do with these images was give a a good sense of the grandeur of the location. This meant placing the couple in particular spots and then pulling back so that they became more integrated with the landscape. We also got some more tightly cropped images, but my favorite images from the bunch are those much wider landscape shots. While I mostly shot with natural light, towards the end of shooting I added a Speedlite through an umbrella to bring just a little more attention to them. Off-camera flash is glorious, and I need to utilize it more often. I was ultra-grateful that I had my wondeful wife along to assist, otherwise I wouldn't have pulled that out. So thanks, my love! Tl;dr: I did some engagements (out of the ordinary for me) in a beautiful place. The light was nice, the colors were grand, and the couple was happy. And my wife is a boss assistant. How it all began! Well, with Muir Copper Canyon Farms that is.